HiPi Perl modules version 0.33 has been released. HiPi::Perl modules version 0.32 have been released containing modules that support GPIO interrupt handling in Perl. Threads are created to handle interrupt response and pin value polling. True interrupt handling is implemented via the kernel sysfs gpio filespace and HiPi::Device::GPIO. Direct polling of the bcm2835 registers is implemented using the HiPi:: BCM2835 module. Documentation for the interrupt handling modules is available in the online application help pages. Derived Class Example shows handling interrupts by implementing your own derived class and overriding the base class methods. Callback Example shows handling interrupts by registering callbacks with the base class. 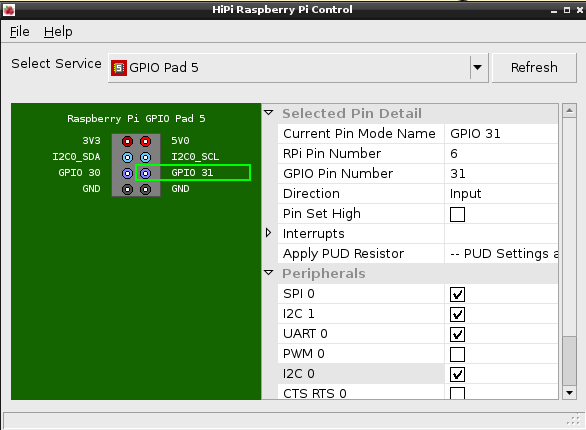 Mixed Handler Example shows handling interrupts for pins managed by HiPi::Device::GPIO and HiPi::BCM2835 with the same process. Full installation instructions are available on the install page. Warning - note that on all recent versions of Raspbian the second I2C bus pins are used by default for several functions so you may not want to get access to it in the manner described here. HiPi Perl modules version 0.27 has been released including tested support for using a second I2C bus on Model B Revision 2 and Model A boards. The modules also install a utility command that you can use from any scripting language or the command line to enable this second I2C bus. (Install or Upgrade Instructions). To get access to this second I2C bus you need to solder some pins or a connector to the P5 header on your Raspberry Pi. The eight through holes for the P5 pad are next to the GPIO Pad 1 pins but are offset slightly because they are designed for a connector to be attached on the reverse side of the board. There isn't actually room for a connector on the same side as the GPIO Pad 1 pins. However, as demonstrated elsewhere in various blog posts, it is possible to solder pins at a slight angle so that there is room for a ribbon connector on the standard GPIO Pad 1 pins and individual connectors on each of the PAD 5 pins. I found Alex Eames' article and video at RasPi TV helped me make up my mind how to approach this. You can see from the picture above that I have soldered pins next to the GPIO 1 Pad rather than in the manner the P5 header was designed for, on the reverse of the board. If you do this too, remember that the pins are effectively the 'wrong way around' from left to right as shown in the picture on the left. At the raw level, the way to enable the second i2c bus is to set the function of GPIO pins 28 and 29 to ALT0 and then activate internal pull up resistors on each pin. However, there is one slight caveat. By default and during load of the i2c kernel device driver, the Broadcom I2C0 peripheral is assigned to pins on the S5 connector of the Raspberry Pi by setting the ALT0 function on GPIO Pins 0 and 1. You may note that on Model B revision 1 boards GPIO Pins 0 and 1 were broken out on the main GPIO Header Pad 1 for use as the default i2c pins used by /dev/i2c-0. 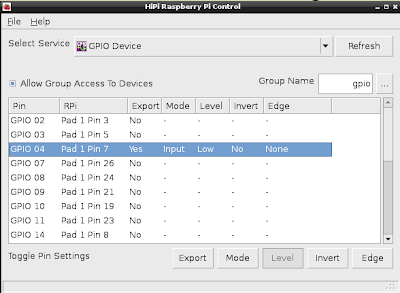 The new arrangement on Model B Revision 2 and Model A boards is to use the I2C0 peripheral to support the Raspsberry Pi Camera Module that will plug into the connector on S5 and to break out peripheral I2C1 as the default i2c bus on the GPIO Pad 1 header. To use the I2C0 peripheral on the pins 28 and 29 broken out by P5 you must first remove the existing assignment to pins 0 and 1 on S5. This is achieved by setting pins 0 and 1 to simple inputs before assigning pins 28 and 29 to ALT0. Of course this means you can have either S5 supporting a Raspberry Pi Camera or P5 supporting a second i2c bus, but not both at the same time. You can switch back and forth at any time. This may prove useful if you want to access the I2C0 bus using the standard kernel i2c device drivers. After the kernel module is loaded you can call "hipi-i2c e 0 1" to make the I2C0 bus available on the P5 header pins. Finally, you can also use the HiPi Control GUI application to enable and disable the I2C0 bus on the P5 header manually. It is worth making a few points about the actual soldering for any reader new to this. I have 50 year old eyes and hands and use soldering equipment that cost lest than the Raspberry Pi itself. I am a novice in it its usage. I would count myself as reasonably adept at manual tasks. Where precision is required I find I've naturally developed techniques to compensate for the declining precision of my fingertip touch and movement. So I thought I'd report on just how easy soldering actually is in general and for connecting to the P5 pad in particular. I found soldering pins to the Raspberry Pi P5 header a different experience altogether. I'm fully aware that the cause of my problem was cheap / old soldering tips - but I reckon that is what a huge number of Raspberry Pi owners will end up using - initially at least. Given the proximity of other pin-outs and surface mounted components I found it all rather difficult to get right. However, it turns out that removing quantities of misplaced solder is not so difficult and the Pi is quite robust given any reasonable level of care with the soldering iron. I only ever achieved the 'perfect volcano' shape on pin 1 which I would guess is down to the much greater surface area of the square pin 1 pad but visual inspection under the eyeglass told me that the other seven connections were probably good enough for my purposes and a check with the multimeter confirmed that continuity was where continuity should be. I decided that overall it is a bit pointless having a Raspberry Pi unless you are willing to take a soldering iron to it and encourage others to do the same. Be aware of what might happen when you grab the bare uncased Pi with your sweaty hand dressed in your polyester and nylon fleecy. Then grab it anyway. Earth yourself first if you're not adventurous. I can assure that the current financial austerity in place at chez Wallasey would not allow the automatic replacement of a fried Pi. But you have to do stuff if you are going to learn and that's the reason for me having a couple of Raspberry Pi's in the first place. Raspberry Pi - concept priceless, implementation $25. Get soldering and have fun. Yesterday I posted about setting up Netatalk so I could see some directories on my Raspberry Pi from a Mac OS X machine. To recap, my goal was to be able to use a remote debugger and IDE on the Mac to develop code running on the Raspberry Pi. The IDE I use is Komodo. It is proprietary application but I can't bring myself to relinquish its features. Whilst Komodo can remotely debug quite happily without any integration with the remote system, to take advantage of many of its features and persist your settings across invocations of the remote code it needs access to the code source files. For the Mac, the netatalk setup gave me that. Next I wanted to be able to access the same Raspberry filesystem from Windows and Linux. 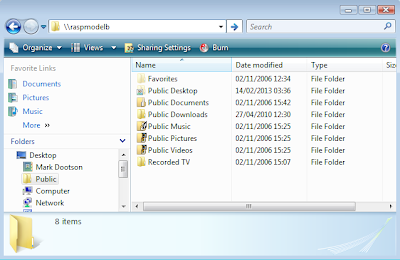 Samba is an implementation of CIFS (Common Internet File System), a network sharing protocol commonly used by MS Windows operating systems to share files and resources. We can use it to share some directories on our Raspberry Pi so that they look like Windows shares to the other machines on our network. The advantage of Samba is that in addition to our Windows machines, the Mac OS X and Linux machines on our network will be able to access the shares without difficulty. We can provide for all three client types with a single service running on the Raspberry Pi. On the Raspberry Pi we install the Samba packages. Samba provides a utility that will check your configuration file, and output the result stripped of comments and default settings. We will use that to produce our configuration file from a master that we shall edit. The following is my master config file that you may paste and edit. You will need to edit it. This setup is good for any network where you are not running a Windows Domain Controller. 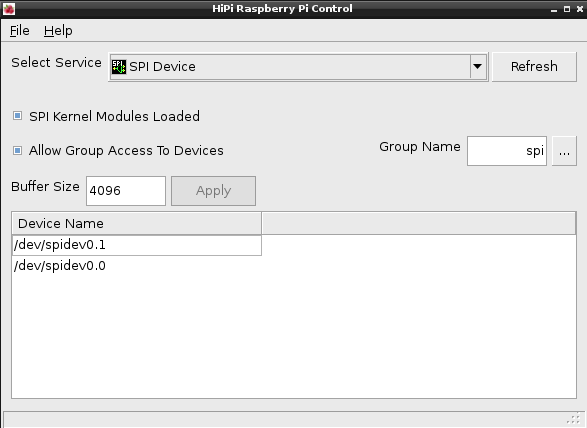 I have shared two folders, the user pi home directory and the 'pi' subdirectory of a usb hard drive I have connected to this Raspberry Pi. The shares will appear as 'piraspmodelb' and 'raspberryusbdrive'. Obviously you may only want to share the 'pi' user home directory so you will only have one share section. Samba offers the facility to automatically share home directories to logged in users under the config setting '[homes]' in the conf file. I did not want this as the share will be called after the user name (in my setup 'pi') and some clients (Mac OS X) will auto-mount this under the share name (/Volumes/pi). If I have a second Raspberry Pi and I use the same setup, then the home directory for user 'pi' on that Raspberry Pi will be mounted as /Volumes/pi-1. The problem with this is that the assignment of the names is not stored between invocations. So the next time I reboot my Mac /Volumes/pi and /Volumes/pi-1 may point to different things depending on which one I access first. If you would prefer to use the standard Samba [homes] share for user home directories you can use this link to a simple smb configuration example. 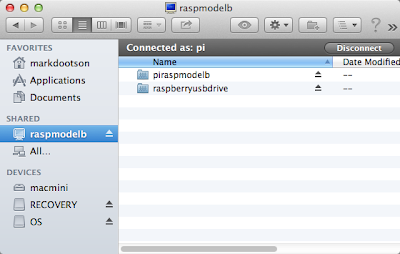 I chose the name 'piraspmodelb' as I'm currently the lucky owner of two Raspberries, a Model A and a Model B so I'm easily aware of whose home directory on which Pi I'm pointing at. Note that I made both shares 'browseable'. This simply means they will 'appear' to network browsers that have not logged in as a particular user yet but has no effect on whether the files in the share can be viewed. You may need at least one share to be 'browseable' as some client implementations fall over without this. After you have saved the file and exited 'nano' you can test the syntax and overwrite the actual configuration at the same time. but you cannot. The command redirection '>' would be applied by your current user shell to the output of 'sudo' and you don't have permissions to write to /etc/samba/smb.conf. We have to call the 'sh' shell command with sudo and pass the whole command we want to run wrapped in quotes as the -c parameter. You will be prompted for your pi user password, which if you have not changed from the default will still be 'raspberry'. Our shares should be visible to client machines on our network. When connecting your user and password will be requested which in my case remains 'pi' and 'raspberry'. I select both the available shares to mount ( in my case 'piraspmodelb' and 'raspberryusbdrive' as defined in my smb.conf). 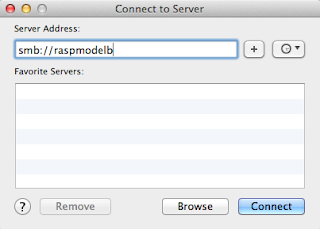 The shares are now both browseable in Finder under 'raspmodelb'. 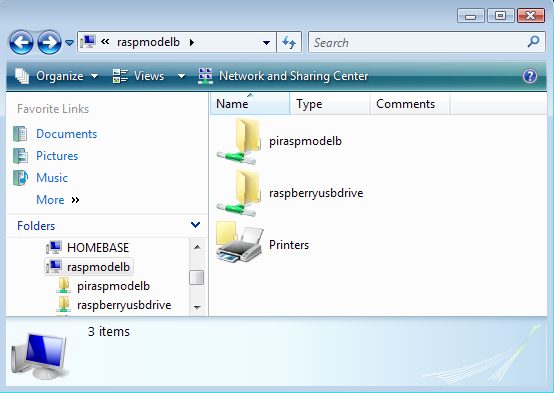 In Explorer type the netbios name of your Raspberry ( \\raspmodelb for my example ) in the address bar and press enter. This should display your shares. It is my preference to map network drives for each of the shares. Right click on the share name and choose 'Map Network Drive.'. 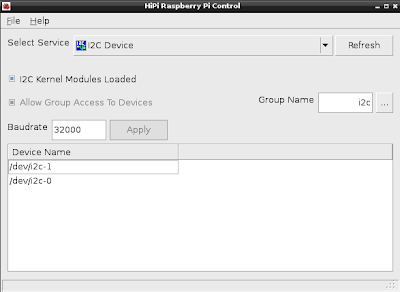 Remember to select 'Connect using a different user name' in the resulting dialog and enter your pi username and password. For Linux we'll mount the shares as part of our file system. My tests for this were done using Ubuntu 12.04 which seemed to have everything necessary installed by default. On other systems, the commands will be the same but you may have to install packages to support CIFS. For the shares we created on the Raspberry Pi we'll need two mount points. In my case I simply named the mount points after the share names, but this isn't a requirement. You may choose whatever names you wish. Then we mount the drives. 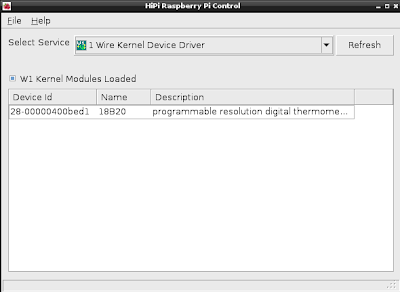 I have found that this works best without problems if the Raspberry Pi is referenced by IP address. 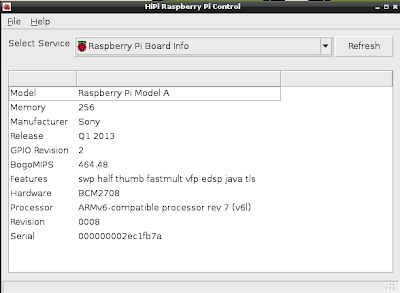 Get the IP address of your Raspberry using the command 'ifconfig' on the raspberry. Unless you have some custom setup you want the IP address of eth0. 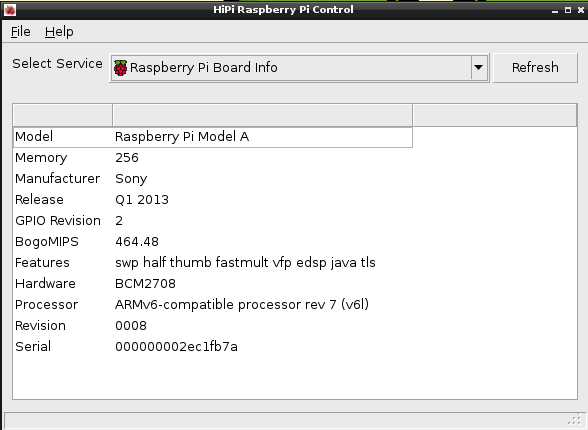 For this example we'll use an address of 192.168.0.5 for the Raspberry Pi. This may be all that you will need to get a working setup but it relies on a coincidental match between the numeric uid of your user on the Linux client and the numeric uid of the 'pi' user on your Raspberry. 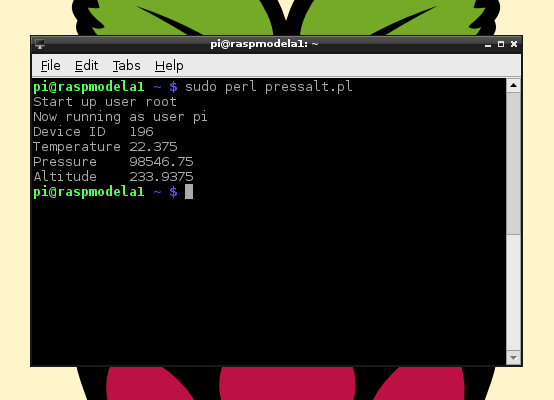 On the Raspbian Wheezy, the user 'pi' has the numeric uid 1000 and group gid 1000. For many users with their own personal installations of a Linux distribution the user they created when first installing the distribution and continue to use as a general login also has a uid of 1000 and a gid of 1000. So when the CIFS client is mapping the ids as a user with uid and gid 1000 exists on both systems, all works well. If however your login user on your Linux Client doesn't have the uid and gid 1000, but some user on your system does, then all the files in the 'pi' home directory on your Raspberry that you mount on the Linux Client will appear to belong to user 1000 on your Linux Client - which is not your current login user. You will be restricted according to the permissions on each file and directory but as they likely will all belong to user 1000, you won't have write access to anything. and all should work OK. It is possible to alter your /etc/fstab on the Linux client so that the Raspberry Pi shares are mounted automatically. I don't do this because I don't like putting entries in fstab for devices that are often not present - and my Raspberry Pi is often powered off while I mess with circuitry. I've been using a Windows machine as my main desktop for any number of years but last Friday the current incarnation of 'homemachine' accompanied one of its occasional blue screens of death with a blue pall of smoke. So I'm trying out my Mac Mini as a regular desktop using only 'free' stuff. I've become a bit lazy over the years using a gui for everything but I'm getting back into command line operation quite quickly for many things. One thing I have to write about is just how easy it is to provide yourself with visibility of your Raspberry Pi file system in Finder. The following works on the current Raspbian Wheezy. paste / type the following into the file. That's it. Now in your Mac, open Finder and open the network. Your Raspberry Pi will be visible. Open it. An initial connection attempt will fail. Choose 'Connect As' and enter a username / password ( pi / raspberry ). You will see your home directory listed as "Home Directory". Information on the options for Netatalk here. There are some problems with nullmailer that caused me to change to Postfix. I've written about setting up PostFix here. Nullmailer continues to attempt to send even permanently rejected mails every time the queue handler runs. I suppose it would be possible to write a script to delete queued items over a certain age and synchronise this with Nullmailer. But given the limitations that Nullmailer's minimalist implementation imposes, I switched to using Postfix with a null (send only) setup. At some point you are probably going to want to send email from your Raspberry Pi. If for nothing else, it would be nice to receive the system notifications that processes often mail to 'root' or the login user. My own need to setup a mail system has arisen because I want to schedule jobs using cron as part of a project. By default, if a job scheduled using cron fails, its output is mailed to the running user (normally root). I want this email to be delivered to an external user, rather than sitting in the root mailbox on my Pi. During installation you will be asked for your required hostname and a remote mailer. You can just accept the (probably non-working) defaults for now. Once nullmailer is installed, we can configure it. Configuration is achieved by amending or creating several configuration files. All but one of the nullmailer configuration files (/etc/nullmailer/remotes) contains a single line with one entry. It should contain a single line containing the following parameters (replaced with your Google account and password, of course). The examples cover two or more lines due to restrictions of the web page format. You must put all the arguments on a single line in your configuration file. Optionally, if you want mail for local users ('root', 'pi' etc) to be forwarded to an external address, edit /etc/nullmailer/adminaddr so that it contains a single line with your forwarding email address in it. Finally, by default nullmailer will retry any failed messages once every minute. This is undesirable. We only want to try and send a message once. Enter the number 0 in this file to put nullmailer in one shot mode and save the file. It will still try to send all outstanding messages every time the system adds a new one to the queue, but this is OK. This file is used on systems that don't have /etc/mailname present. Your Rasbian Wheezy has /etc/mailname present so you can ignore this config file. Delete /etc/nullmailer/me if you have created one during a previous configuration of nullmailer. This is normally the same as the output from /bin/hostname. Some programs may use this file to create the domain part of an email address. You can leave this at the system default if you are sending out mail from an email account such as your Google mail account. If you are using a remote smtp smarthost and you have an entry in /etc/nullmailer/adminaddr you may have to reconfigure the hostname in this file. Programmes such as the 'cron' scheduler will use the value in /etc/mailname to form their 'from' address. Nullmailer does not rewrite full domain addresses where they exist. If your /etc/mailname contains a host name that does not really exist, such as 'raspberrypi.somedomain', then this is used as the from address (and therefore the default reply-to address). The smtp server you are connecting to may reject your mail if it cannot establish a viable return address. If you are using an external smart smtp relay then your only option is probably to put your real domain name that accepts your email here. For example, for me that would be 'znix.com'. When you read through the descriptions of the other configuration files below remember that for my case because I have 'znix.com' in /etc/mailname, programs such as 'cron' will send mail To root@znix.com, From root@znix.com. Nullmailer will regard the To address as being for a local user ( the domain is in /etc/mailname ) and so will send it to the email address in /etc/adminaddr. The smtp relayer will see 'znix.com' as a valid return mail host so will accept the mail. With an internal smart smtp host you can set up that host to rewrite the from and reply-to addresses for mail coming from your internal network. This file contains a list of remote email servers that you wish to send your outgoing mail to. When mail is ready to be sent, nullmailer will try each of the configured servers in turn until it succeeds in sending the mail. If all servers fail, nullmailer will leave the messages in a queue and attempt the process again after the period specified in /etc/nullmailer/pausetime. Note: Any of the configuration entries below must appear in /etc/nullmailer/remotes as a single line for each server entry. however, you are unlikely to have a mail server that accepts direct unauthenticated connections on port 25 so nullmailer allows you to pass several parameters to control how you connect to the server. Some ISP's set up their mail servers using SSL certificates with common names like *.domain.com. If nullmailer is connecting to the server mail.domain.com then it will regard any certificate with a common name other than mail.domain.com as insecure (correctly) and will not send your login details. You can pass an option so that nullmailer accepts any SSL certificate. In this case you are only using the certificate to encrypt your login details and not relying on it to identify the remote server. this flag if x509 files are in DER format. Nullmailer also supports the QMQP protocol. Just replace 'smtp' with 'qmqp' in your /etc/nullmailer/remotes configuration line(s). either of the following will work in the remotes file to use a Google mail account to send email. Processes on your Raspberry Pi that create emails will send them to the local user running the process. The email address will normally be created by prepending the login name to either 'localhost', the output of /bin/hostname or the content of /etc/mailname. Then mail for root@localhost will be sent to myname@gmail.com. If the content of /etc/mailname is raspberrypi then any mail address to, for example, pi@raspberrypi will be sent to the address in /etc/nullmailer/adminaddr. If you are using an email account such as your Google mail account to send mail, then this file is not essential. It may be useful if you use your ISP's smtp server or if you are using a local smtp server. If this file contains a hostname, then any email address that does not contain any hostname will have this host appended. This applies to all addresses ( From, To, Cc, etc). If nullmailer receives an email addressed to 'root' from 'pi' and /etc/nullmailer/defaulthost contains 'myraspberry.mydomain.net' then the addresses will be changed to 'root@myraspberry.mydomain.net' and 'pi@myraspberry.domain.net'. If the file /etc/nullmailer/defaulthost is empty, then the domain in /etc/mailname is used. On my own system I have a local smtp host that then relays mail to my ISP's smtp relay. The ISP smtp relay is fussy about the reply-address in the mail being a resolvable host. I set my /etc/nullmailer/defaulthost file to contain znix.com so the mail from my raspberries appears to come from root@znix.com or pi@znix.com. On the receiving end I have filters set up to reject mail addressed to 'root' unless it originates from one of the raspberries. If this file contains a domain name, then any email address that does not contain a hostname that includes a full stop ( period ) other than 'localhost' will have this domain appended. This includes any hostname taken from /etc/nullmailer/defaulthost or /etc/nullmailer/idhost. This applies to all addresses ( From, To, Cc, etc). If nullmailer receives an email addressed to 'root@raspberry' from 'pi@localhost' and /etc/nullmailer/defaultdomain contains 'mydomain.net' then the addresses will be mapped to 'root@raspberry.mydomain.net' and 'pi@localhost'. If the file /etc/nullmailer/defaultdomain is empty, then the domain in /etc/mailname is used. If you are using an email account such as your Google mail account to send mail, then this file is not essential. The file allows you to set the content of the suffix that nullmailer uses when creating message id's for each mail sent. By default, the content of /etc/nullmailer/defaultdomain is used. If required you would normally put a fully qualified domain name (not necessarily real) in here. The message id does not matter outside your system but it is visible in the headers of the mail when sent. You only need this file if you are relaying through an smtp smarthost that won't accept your default domain as a valid mail server. By default, nullmailer uses the value from /etc/mailname for the HELO message in the smtp protocol. Any domain set in this file will be used in the HELO message instead. This config file may prove particularly useful for your setup on the Raspberry Pi. It contains the number of seconds to pause between successive queue runs when there are messages in the queue (defaults to 60 if this file not present). You should always create this file and enter some value. If you want to retry failed email I would recommend waiting an hour between retry attempts ( enter 3600 in this file ). However, if this is set to 0, nullmailer will exit immediately after attempting to send mail once (one-shot mode). This may be desirable if your Pi is only intermittently connected to the network. Without a network connection nullmailer will by default keep attempting to send your mail once every 60 seconds and will write entries for every attempt in your system logs. By putting the value 0 in /etc/nullmailer/pausetime, nullmailer will attempt to send each mail added to the queue just once. You must attempt to resend queued mail manually. will cause nullmailer to attempt to send all messages in the queue. You don't need to set this file unless you have a very specific requirement. The file contains the number of seconds to wait to complete sending a message before killing the attempt and trying again (defaults to 3600 if this file not present). If this is set to 0, nullmailer will wait forever for messages to complete sending (probably a very bad thing). If you are using an email account such as your Google mail account to send email, then much of the configuration concerned with address munging does not really matter to you. You may only need to configure /etc/nullmailer/remotes to set your ISP server and /etc/nullmailer/adminaddr if you want local mail forwarding somewhere. Conversely, if you are communicating with a smart smtp relay then applying address mapping and identification settings that result in routable email addresses is probably essential. Hopefully nullmailer can be configured to suit your needs. In either case, the capability to switch on manual queue delivery using /etc/nullmailer/pausetime should prove useful for many projects where the Pi has an intermittent network connection. Version 0.26 of the HiPi Modules has been released. It contains some minor enhancements. I found that some devices with software reset commands don't complete the conversation when 'reset' is sent and leave the caller reporting an error. I added commands to the appropriate device modules that handle this. There was also a bug in the baudrate setting method for bcm2835 based I2C. The baudrate was always applied to I2C-1 even when I2C-0 was specified. This is now fixed and would appear to allow running two I2C buses at differing baud rates. My last post on the topic of repeated starts and i2c - I hope. It turns out that some folks actually use languages other than Perl on their Raspberries. So I've provided easy access with a command line utility as part of the distribution that can be called from Shell, Python, Scratch etc. It's a setuid executable ( to have the permissions necessary to map specific parts of /dev/mem ) and installs with execute permissions limited to the i2c group. So any user in the i2c group can now use this method of communicating with an i2c slave if required. Docs for the command line utility. It seems possible to control the speeds of i2c-0 and i2c-1 independently. It will have to wait for me to solder some connections to a Pi for confirmation. The module version 0.22 had some timing issues with the hardware ( susceptible to hangs under high load ) . HiPi Modules version 0.23 has been released with appropriate fixes. For info I have three main i2c devices that I have used for testing the latest release. The MCP23017 port extender has been tested at 1MHz, 400Khz, 100KHz and 32KHz with the system under both heavy and light load using full 22 byte reads and writes. The MPL3115A2 pressure and temperature sensor that requires the repeated start operation has been tested at 1MHz, 400Khz, 100KHz and 32KHz with the system under both heavy and light load using 24 byte reads and single byte writes. I also have an ADC from UK supplier HobbyTronics that employs clock stretching. I need to run the bus at 32KHz for this controller to work but it too has no problems at that speed. It all seems good now. I've recently returned to tinkering with Perl on the Raspberry Pi and have published the results as a set of modules and a GUI application. Unlike my previous effort I've abandoned the idea of a whole distribution of Perl containing the modules I required. The new module distribution is designed to be installed in the standard system Perl on Raspbian Wheezy and installs nearly all of its dependencies using apt-get. The only exceptions are the Perl GUI modules. As the current maintainer of wxPerl I wanted the latest and working installation of Wx and wxWidgets. This isn't available in current Debian based distributions so I've provided pre-built binaries that are installed using PAR::Dist. 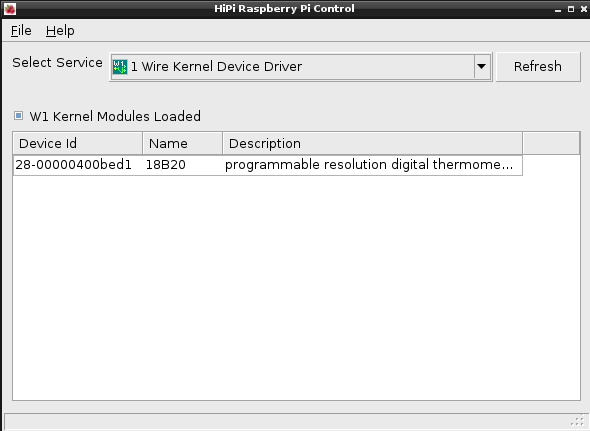 I'm quite new to coding access to device drivers and obviously new to accessing the hardware directly so having figured out how to do what I wanted to I decided to wrap up controlling the GPIO and device settings in a GUI. I found some nice detail about board revisions on the Raspberry Pi Wiki and combined that with the content of /proc/cpuinfo to populate the first tab of my application. 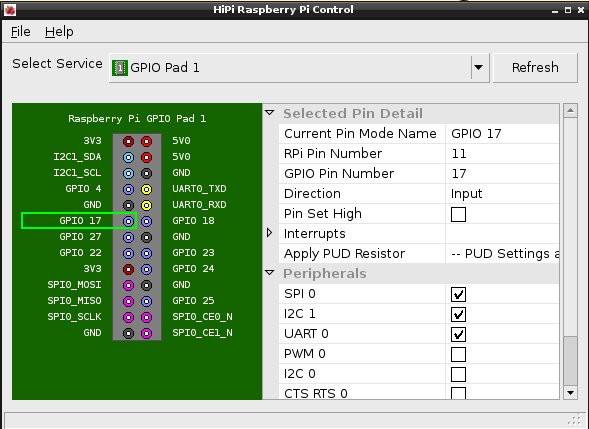 Onwards to controlling the GPIO pins directly using the bcm2835 library. I implemented just about everything available in the bcm2835 library for the second application tab and then put a few guards in place for combinations of actions that succeeded in hanging my Pi. It was a bit indulgent implementing a specific GPIO pad control, but there was PAD 5 to think of and the opportunity of code reuse. It gave me a surprising degree of satisfaction switching the peripheral function assignments on and off and seeing the results populate my 'PAD Control'. Reading the Broadcom information sheets, I found that it isn't possible to query the current state of the pull up and pull down resistors. The settings persist across reboots so it you play at applying resistors to see your input pins go high /low, remember you'll need to set them back at some point. I'm also now pondering whether to take a soldering iron to a precious Pi to connect PAD 5. Activating the peripheral function for I2C 0 assigns a couple of pins on this pad. I took on the GPIO device driver next which exposes the interesting facility to use kernel interrupts with the GPIO pins. It also offered the promise of having a setup that does not require running with root permissions to control the pins. This introduced me to udev rules and the documentation here. Searching the Raspberry Pi forum was also productive. The next tab brought this together. It writes or removes udev rules that give read / write permissions to members of the group 'gpio' on the gpio device files. I added a button to allow easy management of the group. It is important for any interface that it supports attaching an LED to a pin and allows toggling it on and off. This is no exception. I found that changes made in the GPIO Device tab were reflected in the GPIO Pad tabs. 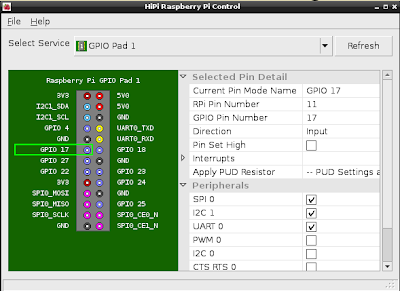 However, changes made in the GPIO Pad tabs were not picked up by the device driver. It seems reasonable that should be the case. Armed with my new knowledge of udev rules it was time to implement the tab for the I2C device. And lo it was found that in the current Raspbian Wheezy the I2C driver already implements read write access for the group 'i2c'. All I needed to implement was a checkbox to load / unload the kernel modules and code to read and write some configuration files for the 'baudrate' kernel option. I have a couple of I2C peripherals that seem to employ a communication method called 'clock stretching'. In short, it is a method by which a slave device (my peripherals) can tell the master ( the Raspberry Pi ) to hang on a bit while the slave prepares to reply to a request. It seems the combination of the i2c device driver and Raspberry Pi hardware ( I'm not sure which bit is responsible ) do not currently support 'clock stretching' and the Raspberry Pi ignores the slave's request to wait. However, there's an easy workaround as the device driver supports an option, 'baudrate', which is used to set the I2C bus clock rate. The default value of 100000 prevents some of my peripherals from working, but with a value of 32000, all is well. It may not be an ideal solution. Everything on the bus is slowed down. For my usage though, it suits well. The settings made in the tab are written to configuration files so apply to any modprobe load / reload and across reboots. 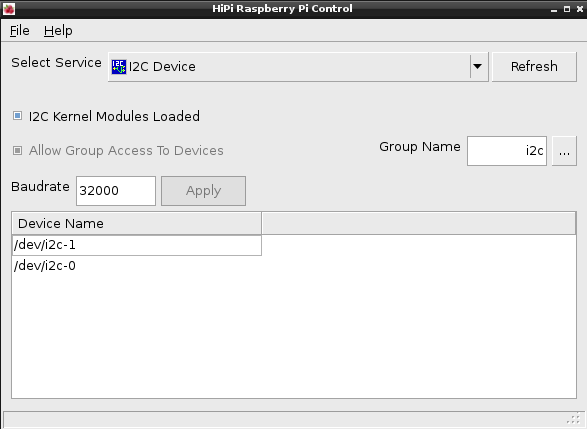 As the default device driver settings apply permissions for the group 'i2c', the option to switch that on and off is disabled. So, controlling the SPI device ought to be virtually a copy of the procedure for I2C. And so it proved. The SPI device driver does not automatically give a group read / write permissions on its devices so I needed udev rules here. Because the SPI driver produces device files in /dev, the udev rules were much simpler here than for the GPIO driver. The SPI driver also exposes an option 'bufsiz' so I provided the opportunity to set a value for that. It's unlikely you'll need to alter the default 4096 value. The settings made in the tab are written to configuration files so apply to any modprobe load / reload and across reboots. Finally I have a 1 Wire temperature sensor so the HiPi modules include a thin wrapper for kernel device driver. The tab for 1 Wire just lists the attached slave devices and allows loading or unloading of the kernel modules. And that's it. The GUI was just a fun exercise as a way of implementing something useful without needing any specific attached peripherals or circuits. There are some interesting modules in the distribution that provide high level wrappers for communication with some common ADCs, DACs and the MCP23017 extender ( it's greeeaaat !). There are also a couple of 'LCD control by serial' implementations. My hope is that the GUI is interesting enough to download and try. Then I'll have captured ye all for the Gods of Perl when you start making your own improvements and additions.